Acer late last month announced the world’s first tablet running Chrome OS. Today, HP followed it up with a much higher-end offering in the HP Chromebook x2. HP’s latest is more of an iPad Pro competitor than a standard tablet used strictly for media consumption. Featuring a 12.3-inch Quad HD (2,400 x 1,600) touch display coated in Corning’s Gorilla Glass 4, the Chromebook x2 is powered by Intel’s 7th generation Core m3-7Y30 processor alongside up to 8GB of RAM and 32GB of expandable local storage. The slate measures 8.2mm thick and weighs in at 1.62 pounds although when you add the keyboard, the detachable swells to 15.3mm thick and 3.14 pounds. Other noteworthy specs include dual speakers tuned by Bang & Olufsen, a 13-megapixel rear-facing camera, a 5-megapixel front-facing shooter, two USB Type-C ports, a microSD expansion port and 3.5mm audio jack. Battery life reportedly checks in at up to 10.5 hours. 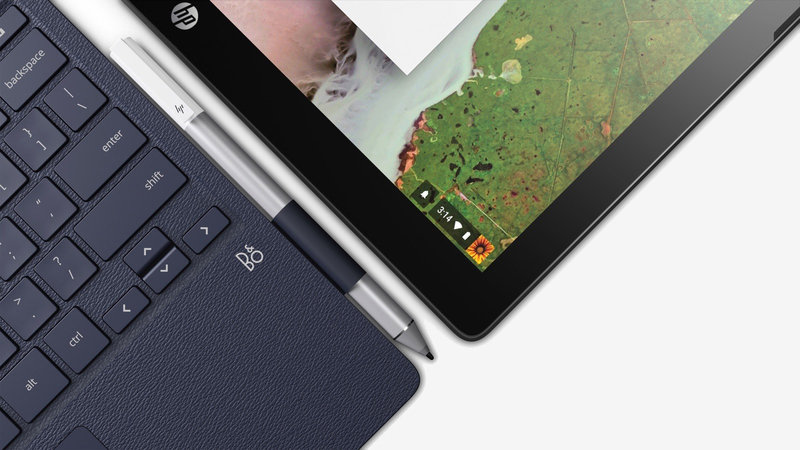 The HP Chromebook x2 starts at $599.99 which includes the bundled keyboard and stylus. That’s a bit more than Acer’s offering but this is also targeting a different audience. With it, HP hopes to appeal to consumers that are considering Chromebooks as PC replacements or supplements whereas Acer is primarily targeting the education market with its slate. It goes on sale on June 10 via HP’s web store and at Best Buy.